Philadelphia Phillies: Have Wins Been Redacted? I haven’t bought a pair of underwear in six years and honestly, I’m a little peeved that I have to do it again so soon. My husband says that’s an unrealistic expectation. Since 2016, we’ve had a lot of those. In honor of the Mueller report, this blog is being redacted. I don't know what that means exactly, but from watching the news, I'm guessing lubricant and latex don't apply. I guess I could Google it but I'm not that type of intellectual. I get my energy from the air. My point is, I have no idea what I'm doing. My husband wants to know how that's different than any other day. Here's what women say about their partners in therapy. At this particular moment, I'm sure one of these applies. This morning I dusted my bedroom, filed my tax stuff and put my winter clothes away. All of this started simply by trying to find my cell phone. The regular major league baseball season is 162 games. The total accumulation of bouts that go well vs. those that go horribly wrong, leads to either a happy wife or one that'll pack on ten pounds until you apologize. Wait, I think I mixed metaphors. My husband says that's not an excuse for getting something wrong. Last Wednesday, the Phillies hit rock bottom in a 15-1 trounce in Game 3 against the former Bryce Nationals. If that happens again, they'll have to build a Nutrisystem stand at Citizens Bank Park. Or schedule some "Bring your dog to the ballpark" games to fill seats. Or risk becoming Marlins Park. By the 9th inning of that romp, Gabe Kapler had a decision to make: bring in a position player to close the game or strip naked. I'm always surprised he doesn't choose the latter. For four games and eight innings, the lineup was a stellar example of veteran experience conjoined with youthful recklessness. You could say it was my own beautiful baseball ménage à trois. In case you're wondering, in that fantasy, I'm in the middle. But just like all good things, Phillies fans found a way to be bitter. It's the first time since 1915 that the team started the season 4 - 0 and people were disappointed about losing the fifth. I figured out what went wrong. I bit into a carrot that was so hard my ears rang for an hour. This is why you should stick with Twinkies. My husband says I might want to take my medication. My point is, the first two losses came in day games that followed night games. I know the frustration. I've had day dreams about night things in the middle of the afternoon too. I know how distracting they can be. Like the Game of Thrones final season premiere this week. I'm making a prediction: My husband will fall asleep. 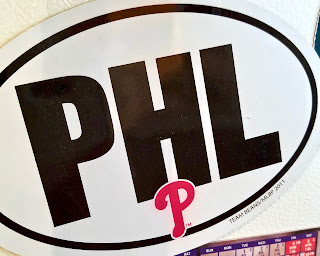 Philadelphia Phillies: Is it Time for a Bryce Harper Tattoo? I've been watching the internet for any sign that this is an April Fool's joke. Three consecutive days of waking up in a euphoric Philly time loop has completely healed the carnage caused by Us. I haven't slept since seeing the trailer. The Phillies lineup, a musical hopscotch of righty, righty, lefty; righty, righty, lefty, is coming together like the chorus line from Newsies. And fans are screen-shotting the National League standings at MLB.com for their profile pics. My dog is even happy. She hasn't snapped at anyone in 24 hours. Or maybe that's because we took her to my in-laws where Aunt Lisa fried her a steak. Even Gabe Kapler was celebrating. I swear I saw him smile.